Launching the family of JEAN DUNAND watches, a continual program of Pièces Uniques, required something more than a mere aesthetic fillip. The watch had to be fresh, original, groundbreaking. At a time when watch connoisseurs are spoiled for choice, a watch commemorating the great Art Deco artist and craftsman had to be heart-stoppingly beautiful and daring. That honor fell to the Tourbillon Orbital, the first of JEAN DUNAND timepiece and an achievement never before seen in watchmaking. 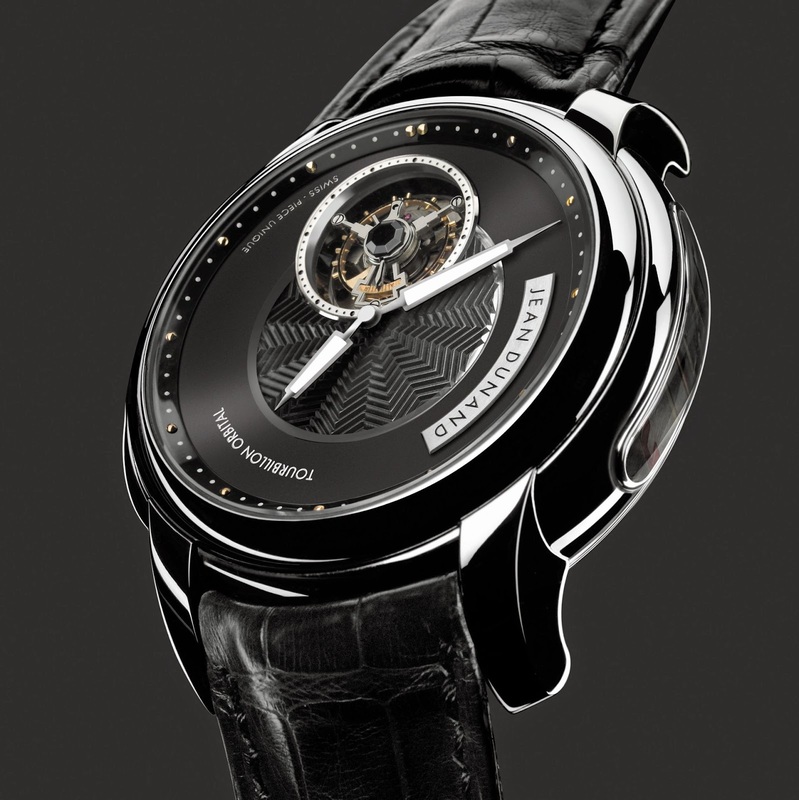 It features a one-minute flying tourbillon that orbits the dial once ever y hour, on a revolving movement. The watch also introduces a novel power-reserve indicator in the case-band, provides a full view of the movement and displays the phases of the moon on the case-back. So extraordinary is this movement that it is patent-protected. With every ambitious watchmaker jumping on the tourbillon “bandwagon”, it is not surprising that some enthusiasts are voicing a backlash. Strange though this may seem, the sheer profusion of lesser tourbillons has rendered the complication almost “common”. Thierry Oulevay and Christophe Claret, however have too much respect for the concept to allow it to be devalued. To this end, they have created the IO200 movement, named after Jupiter’s moon. Invented and constructed by Claret, it defies the opinion of his fellow watchmakers who insisted that an orbiting tourbillon was impossible to realize. It is a gauntlet thrown before the most experienced houses. Furthermore, it returns the tourbillon to its original role as the pre-eminent precision complication. Timing tests prove that the combined rotation of the tourbillon and the movement significantly improves the rate stability of the watch. 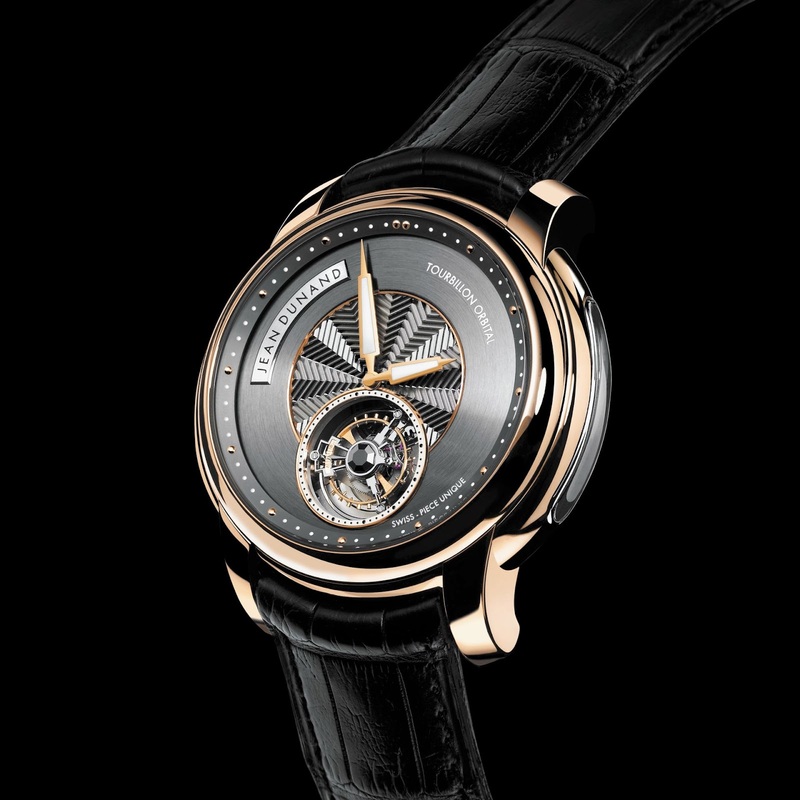 Positioned opposite each other, sandwiched between two plates held apart by pillars and rotating on ball bearings, the barrel and the flying tourbillon orbit the center. 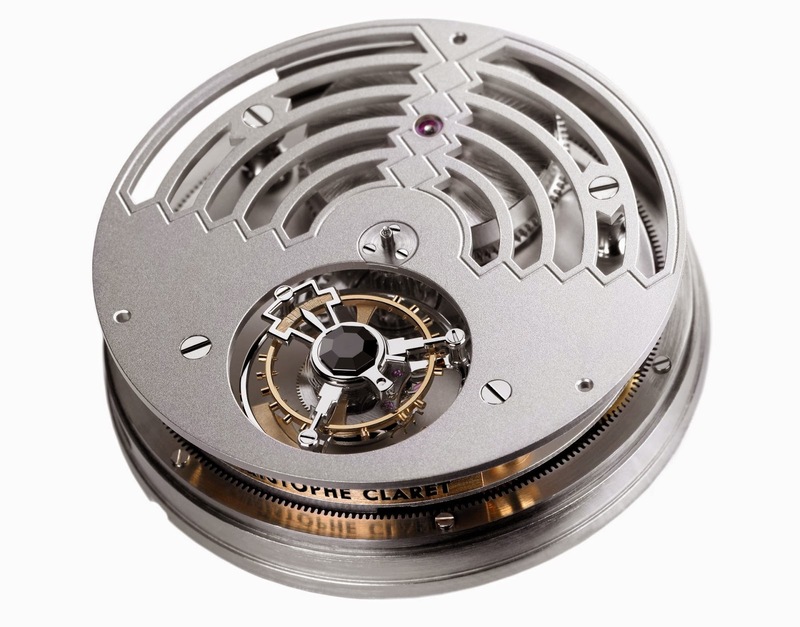 The revolving top plate is open to reveal the tourbillon. The tourbillon has been raised as much as possible to make it more clearly visible. Unwinding against a central fixed pinion, the barrel drives itself and the tourbillon, while the tourbillon escapement regulates the speed of rotation. As it orbits, the tourbillon cage rotates once a minute against a fixed circumference wheel, connected through a gear train. This elegant configuration reduces the number of jewel bearings to 14, substantially lowering friction. Christophe Claret devoted two years to solving the mechanical challenge of winding and setting a rotating movement with a mainspring barrel that never stays in one place. The conventional crown through the case-band was obviously impossible. Winding and setting the movement vertically through its central axis is a new solution in watchmaking. A folding key set into the case-back replaces the crown. Lifting the D-ring of the key engages a central wheel on ball bearings that turns the ratchet-wheel to wind the barrel- spring. Pulling out the key engages the hours- and minutes-hands in order to set them in any direction. Positioned against the fixed chapter-ring, the minutes-hand turns with the rotating dial. Inescapably, the winding key and the moon-phase display on the back of the watch prevent a conventional view of the rotating movement through a sapphire-crystal case-back. 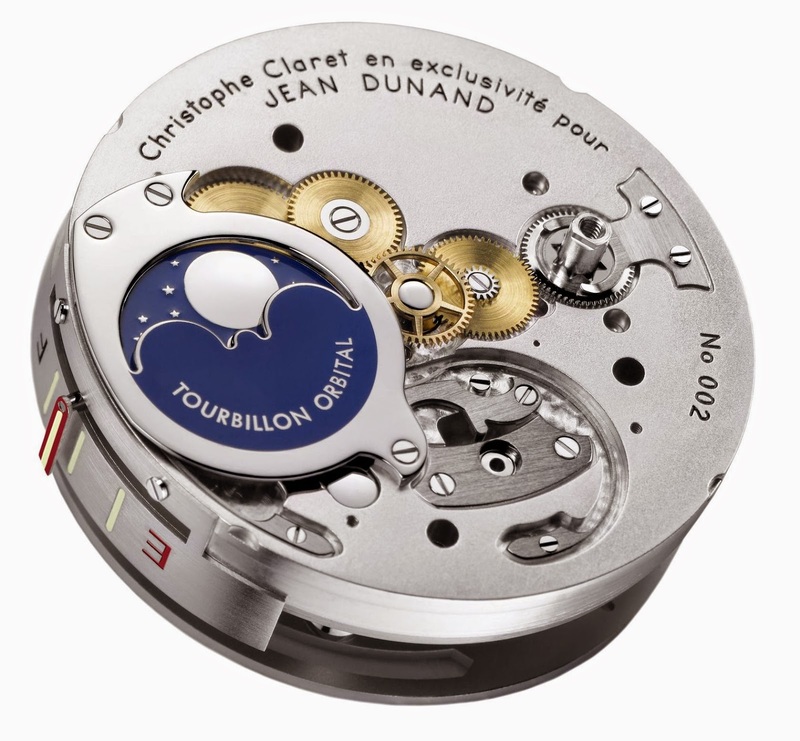 Conveniently, though, the absence of the usual crown at 3 o’clock allowed JEAN DUNAND’s case-makers to provide a fascinating lateral view of the revolving mechanisms by cutting two windows in the case-band. These side windows opened the opportunity for another first in watchmaking – an entirely original way of indicating the power reserve. The window at 3 o’clock displays a vertical needle that moves between F (full) and E (empty). Precisely in the manner of fuel gauges in vintage cars. The secret of indicating the power-reserve in one place from a constantly moving barrel is patented. Calibre IO200, manually wound rotating movement with off-center flying tourbillon, exclusive watchmaking ball-bearing system with triple rotation within one single block, moon-phase display in the back and power-reserve indicator on the side. Vertical winding and setting through the center of the movement from the back. Dimensions: 33mm x 10.4mm (14 1/2 lignes). Bearings :4 ball-bearing races, 14 jewel bearings. Double ball-bearing with slow rotation, thermostatic, one rigid plate and two mobile plates, mainspring barrel and going train rotate around the central ball-bearing system, limited radial balance. Alignment mainspring barrel – center – flying tourbillon. 21’600 a/h, central ball-bearing system. Power reserve : Approximately 110 hours,indicator located in the caseband (linear reading system with gauge).Moon phase :Located in the caseback at 9 o’clock, precision of 29,5 days, lacquered golden disc. Rapid push button: Located in the case back at 6 o’clock, manual push-piece to set the moon. Winding System :Located vertically in the case back at 3 o’clock,two position winder (folding key). In 18k rose gold, white gold or platinum with matching buckle. Two windows in the case band. Fir-tree engine-turned back. Glass: Non-reflecting domed sapphire crystal. Two domed sapphire crystals in the caseband, one domed sapphire crystal in the caseback.Water resistance: 3 ATM (30 metres). Dial : In 18k gold. Hands: In 18k gold,“Skyscraper” style.